A 4,000-year-old ‘super-colony’ of termites was recently discovered in Brazil. This large network of dirt mounds, hidden in plain sight, covers an area the size of Great Britain! This ‘super colony’ is largely hidden from view, and is located in the thorny-scrub caatinga forest of northeastern Brazil. 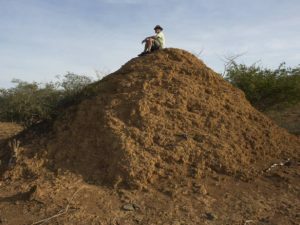 The scientists estimate there are about 200 million termite mounds in this space of about 89,000 square miles. The cone-shaped mounds range from 6 to 12 feet high, are about 30 feet in diameter, and are placed about 60 feet apart. The mounds are not nests, but they are generated by the excavation of vast inter-connecting tunnel networks. 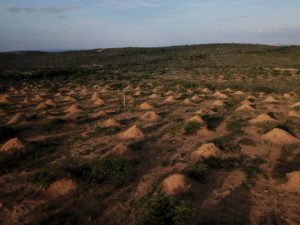 Scientists estimate that in order to build 200 million mounds, the Syntermes dirus termites have excavated about 2.4 cubic miles of dirt. That volume of dirt equal to about 4,000 Egyptian pyramids! “It is the greatest known example of ecosystem engineering by a single insect species,”, the scientists say. The scientists were also very surprised when they received the radioactive dating results from the eleven mounds they tested. The youngest mound was found to be about 690 years old, and the oldest was 3,820 years old. That is close to the age of the Egyptian pyramids. People who live in the region were aware of these mounds. Because they were so well hidden, few outsiders did.